Now President Trump can be part of your LEGO sets because this is the LEGO Donald Trump minifigure. The LEGO figurine is the typical minifigure like you get with your LEGO sets only this one is President Donald Trump in his famous dark blue suit and with his wavy hair and sure this hair is fake but maybe the real President still has his own hair. 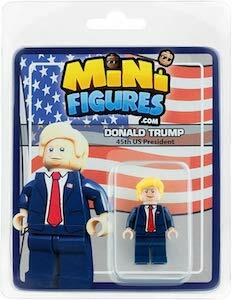 The LEGO action figure of Donald Trump comes in nice packaging so that you can give it as a present to a fan of the President. Help Donald Trump make LEGO great again by adding this figure to your LEGO sets. Barack Obama has changed history with his presidential win. Now you can have a piece of history with the Barack Obama action figure. 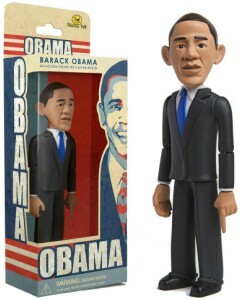 The Obama action figure features a sharply dressed president in a grey suit with a blue tie. With very intricate facial features there is no mistake that this is Barack Obama. Standing 6 inches tall this action figure features 8 points of articulation. So now you can pose Barack in many different ways. Attention collectors! The Barack Obama action figure comes in a window box package so you can keep it in mint condition. The package is decorated in the art work from the Obama “Hope” campaign. If you are a big fan of Hillary Clinton then this action figure is made for you as now you can have Hillary get ready to work for you. This action figure of Hillary is 6 inch tall and has 8 points of articulation. Just make Hillary Clinton stand on you desk looking at you and approve of you work while smiling and being the way she is in her pants suit. This Hillary Clinton ready for action figure is just fun for any one who like politics and specially supporters of Hillary and people who don’t support Hillary can maybe use her action figure for other things not so nice. Nirvana the kings of grunge rock starting a new generation of music, the leader Kurt Cobain will forever be instilled in our heads. 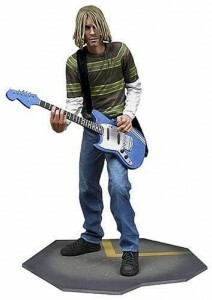 From the hit song “smells like teen spirit” this Kurt Cobain action figure looks just like Kurt in the video, he has his stripped shirt, blue jeans, sky blue guitar and to make it really awesome the gym floor is the base he is standing on. This Kurt Cobain Nirvana action figure stands 7 inches tall and has very intricate details, it will be perfect for any fan and the serious collector as it comes in blister packaging to keep this rock star in mint condition. Johnny Cash the man in black’s first billboard hit was “I Walk the Line” written in 1956. 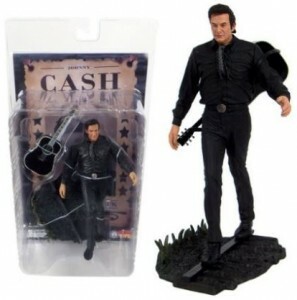 If you love Johnny Cash then you will need to have this “Man in Black” figure in your collection. Remember him at the peak of his career and create a discussion every time someone notices him. The action figure is Johnny all in black walking on a single railway track carrying his guitar on his back. Johnny Cash is fully movable and includes the guitar and base. He stands 7″ tall and comes in a clear plastic package for the serious collectors out there who do not want to remove him from the packaging. Like he says himself, “I’ve been everywhere man”. He should be everywhere with you.